You may have been told as a child not to pick your scabs, even if they were itchy. As hard a temptation as it may have been, if you abided by those words, then chances are you have little to no scars, and your wound healed fast. An itchy wound can drive you crazy, but why do scabs itch? We will dive into this, as well as discuss the secrets to help get rid of the itch. Several factors can lead to the reason why a scab will itch, such as a natural reaction by the nerves when an irritation exists. Let’s look at a couple of other causes. During the second stage of healing, our body releases a substance known as histamine to target the wound or injury, which causes the body to prepare for skin cell regrowth. It responds with a reaction similar to an allergy, and an itchy wound is the result. Itchy scabs result when the new skin begins to grow on the wound. This feeling is compounded by the expansion of collagen cells. The scab itself is crusty and dry, which stimulates an itchy sensation as well. To know why scabs itch, we should understand how a wound comes to be, including the process from a simple cut to its healing time. While our body naturally heals many ailments and afflictions on its own, there are both internal and external factors that can hinder this process. The majority of most wounds go through a four-step process. Commonly known as the bleeding stage, this is when the injury first occurs. Our body responds by starting the healing process. Immediately following the injury, this stage sees the body’s defense with the release of white blood cells to destroy any harmful bacteria. Swelling at and around the wound begins, and the skin undergoes the first stages of repair. This stage can last up to six days. This third stage has visible signs of the skin repairing in the form of scabs. The scab protects the new skin cells that are growing. The damaged skin tissue begins to re-grow over the four weeks of this stage, also known as the fibroblastic stage. This stage begins around the fourth week and is known to last for years. The scarring stage is the last and sometimes hardest stage to get through as the scab starts falling off. The wound now has a redness and itch to it. The excess collagen we produce forms the scars. The first thing you should do when you get a wound is to wash it with a mild soap and warm water. Be sure to use gentle strokes, so you don’t disturb the new skin growth. Doing this may alleviate the itch and irritation by removing dead skin cells. Moisturize the area to prevent dryness that stimulates itchiness. Apply a sterilized covering on the injury to avoid touching or scratching the area. Use a cold compress to alleviate itchiness and inflammation. Avoid wearing tight clothing on the wound to prevent irritation. Wear breathable clothing to protect the wound from sweat. A scab can be a mild nuisance that can quickly turn into a permanent marking on your body if not properly attended to during the healing process. The usual pain and discomfort that you experience during the healing time can often result in a constant itch. An itchy wound must not be scratched, and there are natural ways to relieve the itch as well as other symptoms. Over the period of one month, if the wound does not heal or the itching becomes severe, seek medical attention as it may be a result of a serious health condition. 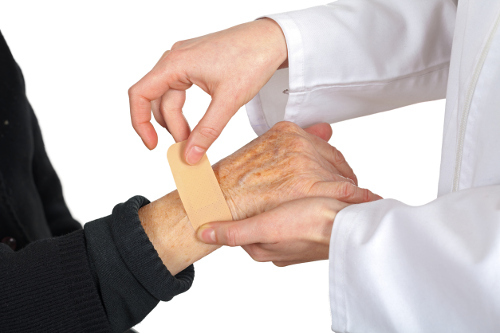 “Why Does A Wound Itch When It Heals?” Wound Care Society, September 30, 2015; http://woundcaresociety.org/why-does-a-wound-itch-when-it-heals, last accessed May 1, 2017. Mercandetti, M., “Wound Healing and Repair,” Medscape, March 12, 2015; http://emedicine.medscape.com/article/1298129-overview#a4, last accessed May 1, 2017. Asaff, B., “Why Do Wounds Itch When They Are Healing?” Love To Know; http://skincare.lovetoknow.com/Why_Do_Wounds_Itch_When_They_Are_Healing, last accessed May 1, 2017.